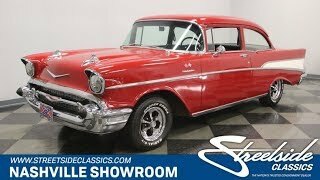 Hi, I am interested in your 1957 Chevrolet 210 (stock #1262-NSH) listed on Autotrader for $37,995. I'd like to get more information about this vehicle and confirm its availability. This 210 is a member of the coveted Tri-five series of Chevys from 1955, 56 and 57. It is last year of production for these models which has several features that make them especially desirable like large tailfins and a twin rocket hood design. But instead of bringing back memories of 1957, this car may actually bring you back to the early 60s instead. Because instead of being an over the top restored show car, this one is more like what families would have owned and been driving in the 60s. Check it out. The Tri-five style is all there! There are twin rockets on the hood and they are just too cool for school! Dressed in a beautiful shade of Red, that big ol hood bends down between headlights perched way out front on the fenders and shrouded with chrome. There is a ton of chrome in the grill with a red, white and blue Chevy bowtie badge in the center. The front end of a car doesnt get any better than that! There is a bold line of chrome running down the side of the car that splits on the rear fender to create a wedge painted in white that mirrors the shape of the tailfins. Even more chrome dresses out the rocker panels while the back bumper joins the chrome of the tailfins to underline the trunk with a clean line and fancy taillight treatment. Keystone wheels complete the look quite nicely and you are sure to attract quite a bit of attention when you drive this car. Open the door and you will find a neat and clean Black interior that is extremely roomy and comfortable. This was one of the reasons these cars were so popular. You could load up with a pile of friends or family, pack the trunk full of coolers, lawn chairs or luggage and head out in style and comfort. The door panel is good looking yet simple with vertical pleats with a slash of chrome cutting below the crank for the old vent windows adding some interest. The big bench seats get the same treatment and there is a two-spoke steering wheel with a full circle chrome horn ring with a center button that has a red, white and blue bowtie and Two Ten in script. Sweet! The dash is pretty simple in black and chrome with the speedometer in the center flanked by smaller gauges. Auxiliary gauges have been added to keep accurate track of engine functions and a CB radio is mounted under the dash on the right. Open the hood and you will find a small block engine that is a descendent of the ones introduced in these Tri-fives. You may have noticed the badge on the front fenders that pays homage to the particularly potent version that was introduced in 1957 with Rochester Ram-Jet fuel injection. The one in this car is a tried and true 350 cubic inch motor with a single carb. A little bit of love could clean things up nicely with some elbow grease to polish up those nice Edelbrock finned valve covers and chrome accessories. Power flows back through a modern 4-speed manual transmission which is another upgrade that compliments the engine nicely. The rubber meets the road through 215/70R14 tires mounted on those great looking Keystone wheels. Come on down and check out this last year model of the Tri-five legacy. You might decide that it is just the car you have been looking for.